​Transfiguration of the Lord Catholic Parish exists to build a community of believers through faith formation, prayer and the sacraments. Led by the Spirit, we witness to the gospel through our service and reverence for all. Diocese of Toledo Safe Environment Program in Full Compliance with USCCB Norms. Each year, the Diocese of Toledo is required to undergo an audit to ensure that it is in compliance with the articles of the United States Conference of Catholic Bishops Charter for the Protection of Children and Young People. Bishop Daniel Thomas is pleased to announce that, for the fiscal year 2016-2017, the Diocese was found to be in full compliance with the requirements in the Charter. The Diocese of Toledo remains committed to ensuring the protection of the children and providing a safe environment for all young people. If you have any knowledge of abuse that has been committed by a cleric, or any employee or volunteer of the Catholic Church, please report abuse to your local police department, Child Protective Services, and Mr. Frank DiLallo can be reached at 419-214-4880 or by mail at 1993 Spielbusch Ave, Toledo, OH 43604. Click HERE To View The Lent Schedule. Mass Delays / Cancelations: If school is delayed on a Wednesday, the 8:45 am Mass will be celebrated at 1:00 pm. If school is canceled, Mass is canceled. Thursday and Friday 11:00 am Mass will be celebrated as usual unless there is a level 3 snow emergency. Mass will be cancelled for a level 3 emergency. If there is a funeral on Thursday or Friday, Mass is canceled. Tickets are on sale for the 2019 Festival Quilt Raffle.The king size quilt was pieced by Pat Smith and quilted by Bernadette (Smith) Haggerty, former student at St. Peter School. Raffle tickets are $1.00 each, 6 for $5.00 or 13 for $10.00 Please contact any student to purchase your tickets. ​Rose Boes and LuAnn Boes head up the funeral luncheons at the St. Mary’s Chapel. They purchase and prepare some of the food while volunteers donate most of it. Volunteers serve, clean up and prepare delicious dishes for the meal. Contact Rose at 419-458-3673 if you would like to be involved. We can always use you. news about what is going on at Transfiguration of the Lord Parish right on your phone. Information on Church, Chapel and St. Peter School all at your finger tips! Just download the “MyParish” App, http://myparishapp.com/ download, free of charge, on your phone or search “My Parish” on your computer and the App store. Our Website has a “MyParish” App button. Check it out! Also on our Website is information on who’s in the military, who to call for the prayer chain, information on baptisms, food pantry, weather cancellations, religious education, Amazon Smile, St. Peter School updates, youth ministry, and minutes from the meetings, such as Pastoral Council. Facebook at Transfiguration of the Lord Catholic Church, Upper Sandusky, OH is another good place to get the latest updates and information about our Parish. ​Please check out all the possible ways to stay involved in your faith community!! We have a need for additional liturgical ministers. Eucharistic ministers, Lectors, and Hospitality ministers are needed for all weekend Masses. If you can help, please call the office and let us know. 419-294-1268 We will be working on the new schedule in May. Please let us know if you are interested in helping out or if there are any changes to be made. There are trainings for all ministries, so don’t be afraid to give it a try and help out. Hospitality is a good family ministry to get the kids involved. Also don’t forget our choirs. If you can carry a tune or play an instrument, the choirs would love to hear from you. KNIGHTS OF COLUMBUS MEMORIAL GARDEN A memorial garden is continuing to be constructed by the Knights of Columbus between the rectory and the church. Orders are still being taken for memorial bricks in honor of a loved one. There are two sizes of bricks available: 4” X 8” or 8” X 8”. 3 or 6 lines of texts with 20 characters per line are available depending on the size of brick you purchase. Cost per brick range from $100.00 to $300.00. Please contact Jerry Davidson at 419-306-5918 to place your order. Please bring food donations to the Masses on the THIRD week-end of the month. Thank you for making the effort to help those who are less fortunate. If you forget your donations on the third weekend, simply bring them on any other weekend and put them in the side sacristy in Upper or in the entrance at the Chapel in Kirby. Folks continue to experience hunger all year long, so please keep donating. Thank you! THANKS TO OUR BENEFIT AUCTION COMMITTEE: Paul & Tonelle Wagner, Ryan and Kristy Gottfried, Chad & Bri Smith, & Kurt & Sarah Beidelschies. This committee and other volunteers contributed their time and hard work to make this parish event a success. It was a fun filled evening for all who attended! We are happy to announce the net profit of this fundraiser is $56,031.97 which will be placed into the Tuition Angel Fund. Monies from this fund will be used to cover part of the cost to educate not covered by tuition paid by our school families. 273 tickets are now entered in the For the Love of Pete Raffle!! $22,550 now donated to school. Thank you to all who have supported the raffle. We are holding a STUFFED ANIMAL DRIVE! If you are doing your spring cleaning and have some gently loved stuffed animals please drop them in the basket at church or school. The drive will run until May 3. All donated stuffed animals will be washed and fluffed then used as prizes in our kids tent for someone new to love. St. Peter's students adopted two Rotary "Be A Good Egg" children. The students were asked to earn one dollar by doing extra chores or errands to donate to the project. We were able to buy Easter outfits, a school outfit and an Easter basket for the children. This was part of our alms giving Lenten challenge. People often ask us what is something we need at school. One item on our Wish List is copy paper. We are always in need of copy paper so if you see a great sale and would like to help out, we can use it. Grade 5 will be visiting the Cathedral in Toledo on April 26th. Our preschool classroom is in need of some additional age appropriate toys (ages 3-4). When doing your spring cleaning this year, if you find any gently used toys that are in good shape and you would like to donate them, just let us know. We might be able to use them. Thanks for all of your continued prayers and support for the students of St Peter School. There will be no RE classes & Confirmation class this Wednesday, April 17th, during Holy Week. We encourage the students and their families to participate in the three days of celebration – please see the Easter Triduum schedule. The Confirmation Class will be attending the evening Mass of the Lord’s Supper, April 18th at 7pm in the Upper church. On Good Friday they will be participating in a Pilgrimage Walk from Frenchtown to Carey. Please keep them in your prayers. Our campaign goal is $200.000.00. As our parish buildings age it will take generous donations from us all to preserve our parish heritage. Please consider donating to this important project. I am always amazed at people’s generosity. 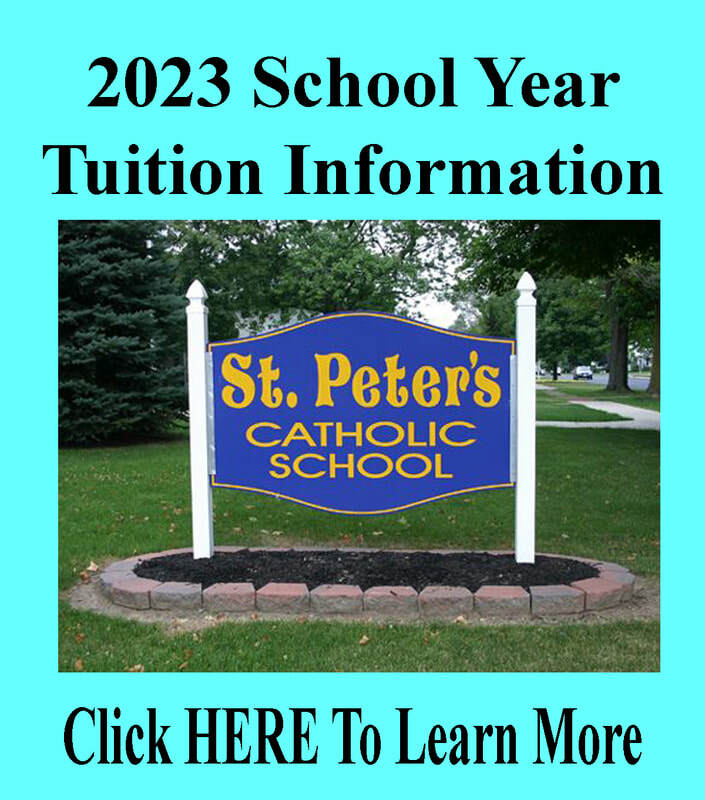 In response to a recent mailing to our out-of-town alumni in which we updated them on the current happenings at St. Peter School, I received a phone call from a former student, Dave Logsdon, who wanted to speak further about how best to help our school. In our conversation, he decided to set up a “challenge grant” in memory of his mother, Carol C. Logsdon and in honor of his father, Maury Logsdon. The Logsdon Family Foundation will match up to $10,000 in support for our school, such as: school library, audio-visual equipment, technology, teaching and learning resources, and the gift that keeps on giving, the School Endowment Fund. If you would like to take part in this challenge, please mark your donation: "SPS Challenge Grant".